Made exclusively with Italian olives picked at the right degree of ripening, in order to preserve the fragrances of the fruit and the presence of antioxidant substances, the “100 % Italian Extra vergin olive oil” is the product of a careful selection, to ensure that only the best quality olive oil lands on our tables. 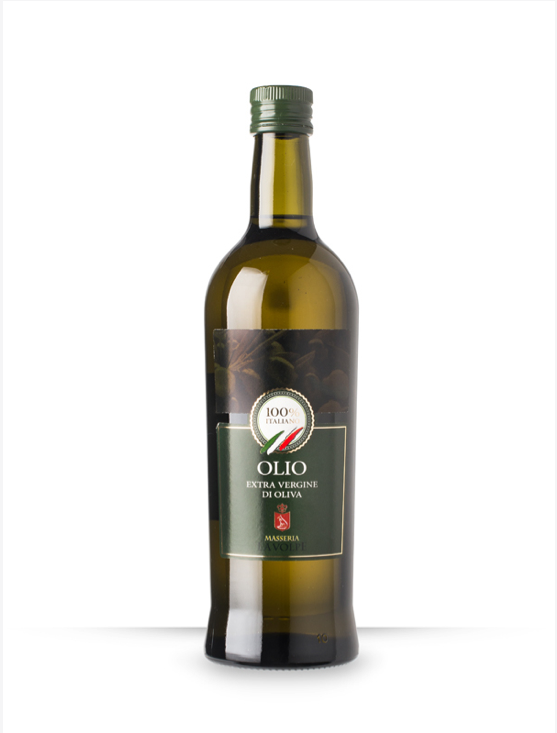 The rich and pleasant organoleptic feature of the filtered extra vergin olive oil is the result of a wise mixture of several olive varieties coming from different olive areas of our country. The harmony between taste and fragrance is given by the balance between the intense fruity green notes and the pleasantly spicy scent of those olive varieties, having a more determined flavour, typical of the southern Italy’s olive-groves areas, and the sweeter and more exquisite scents of other Italian selected cultivated plants. Pleasant olfactory notes with green fruity taste, which remind us of the fresh olive pulp at the right level of ripening and of fresh-cut grass, blend very well with a slightly bitter and agreeably spicy taste in a clear green oil with golden reflections, with a well-defined and balanced character. “The 100% Italian Extra vergin olive oil” has a high cooking stability, thanks to its composition of fatty acids with a low level of unsaturation and also to the presence of antioxidants, which provide this oil with high resistance to changing heating temperatures. It is therefore ideal not only to serve as raw dressing, but also for cooking. Thanks to its aroma and its full-bodied flavour, the “100% Italian Extra vergin olive oil” is particularly recommended for the preparation of those meals, in which we want to enhance the taste of food with the fruity and slightly spicy oil notes. Definetely to taste in vegetables or legumes soups, meat dishes, fresh salads and tasty “bruschette” (toasted bread).